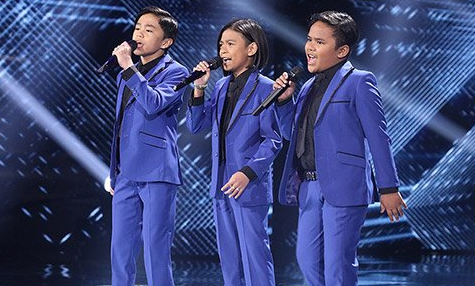 After a series of giving an impressive performance to judges of "The World's Best," the Trio TNT Boys finally exits after defeated in the final championship round. Here's their performance in YouTube. Drew Barrymore: "There is no flaw in one note,""When you have a show called 'World's Best' That's a very high bar to set, and you guys just reach it every time, if not surpass it." The Trio composed of Keifer SAnchez, Mackie Empuerto, and Francis Concepcion performed Jessie J's hit 'Flashlight'. The young singers were defeated by Naturally 7 who delivered an emotional a cappella performance of Coldplay's "Fix You". The TNT Boys received a total 49 percent from American judges, composed of Drew, Faith Hill, and RuPaul - while Naturally 7's garnered 43 percent. However only 18 people from the 50 Wall of the World juries voted for them against 32 for their contender. As a result, TNT Boys received an over all 67 percent while Naturally 7 got 75. The host James Corden right away comforted the emotional Trio with a hug. "Every single person that watched your performance in this show - you have moved them and changed them. And this is just a start of an incredible journey," he told them. The performance of the TNT Boys got mixed reactions, others had extended their cheers to the boys for giving a great performance on the stage of 'The World's Best'.